Technical difficulties and busy lives kept us from posting for awhile. We are back just in time for a special Disney event. Tonight we’re off to Lincoln Center to watch scenes from Fantasia and Fantasia 2000 accompanied by a live performance of the music by the New York Philharmonic. We’ll write a “review” or at least our thoughts on the overall experience when we return. Two years ago we attended a similar event. The NY Philharmonic featured highlights from PIXAR films accompanied by live music performed by the Orchestra. Of course we enjoyed the clips, but listening to the music performed live was a great treat, particularly since the live orchestra infused the music with a richness that you don’t get from a recording. It didn’t hurt having the music performed by an elite ensemble either. Fans of PIXAR know how distinctive each of their films are. The different styles of the films naturally required music that reflected these differences. If memory serves correctly, they showed the opening sequence from Up which functions beautifully as a complete silent movie unto itself. The music told the story with affecting grace. Contrast this with the wild, modern big band jazz sound of The Incredibles. In Ratatouille, we heard the sounds of Paris in the jazz age, and Toy Story gave us the music of an American childhood. These events are a great way to introduce children to concert music while experiencing favorite films in a new way. I’ve enjoyed recorded music for as long as I can remember. I have vivid memories of my parents playing records on their stereo especially on Saturdays when I was subjected to an eclectic mix of Puccini opera, Broadway musicals, Burt Bacharach, Dionne Warwick and Judy Garland. I even liked some of it. Anyway, imitating my parents’ habits, I wanted recorded music of my own damn it! My prized possession was a portable record player which included an AM radio so I could listen to Yankee baseball games (with an earphone if I was in the car). My tastes were distinct from my parents. Sure I had some typical kids fare such as a third rate adaptation of Tom Sawyer and The Adventures of Huckleberry Finn complete with cloying, inane music (hey, I was six or seven). I remember a particularly dreadful adaptation of Pinocchio, decidedly not Disney’s, where the authors never missed an opportunity to rhyme Pinocchio with Tokyo (even as a child I could sense the absurdity of the anachronism for the sake of rhyme). Still, it was not without its child-like charms and by virtue of owning it, I had a certain attachment to it. I even owned a recording of James Mason, with his wife and daughter, telling stories from the Old Testament. I assumed that God sounded like James Mason until I was about 17 years old. But I had some truly great music too. When I was in kindergarten I expressed an interest in The Beatles. One night, my father came home from work with a copy of Sgt. Pepper’s Lonely Hearts Club Band for me. I can fairly say that was the day music came to life for me. I must have played that album a thousand times and while listening to the music, I would study every inch of the album cover, the interior photo of the Beatles festooned in exaggerated Edwardian garb, and the lyrics set forth on the back. I acquired many more Beatles singles on 45rpm discs and decades later I still own and play them. Naturally, I also acquired an extensive collection of recordings put out by the Walt Disney Company. Some of these were soundtracks from the movies. Typically, a soundtrack album would include some of the dialogue and most of the songs from a movie as well as a booklet featuring an abridgement of the story and illustrations. My childhood predates home video, so these albums enabled the listener to experience Disney movies after they left the theatres. As I grew older, I gave many of these away, which ironically I ended up repurchasing from eBay when my children were young. I also eBay purchased a number of albums that reflected theme park attractions such as The Haunted Mansion or The Jungle Cruise albums. Just as I did, my children grew up listening to The Beatles and Walt Disney Records, both of which provided a happy soundtrack to their childhood, while the Disney recordings also kept the memories of the theme parks vivid inbetween visits. Mouse Tracks, the Story of Walt Disney Records written by Tim Hollis and Greg Ehrbar is an excellent chronicle of the Disney recording studios. The book gives a comprehensive history of this enterprise and illustrates how the growth of Walt Disney Records parallels the growth of the overall company. 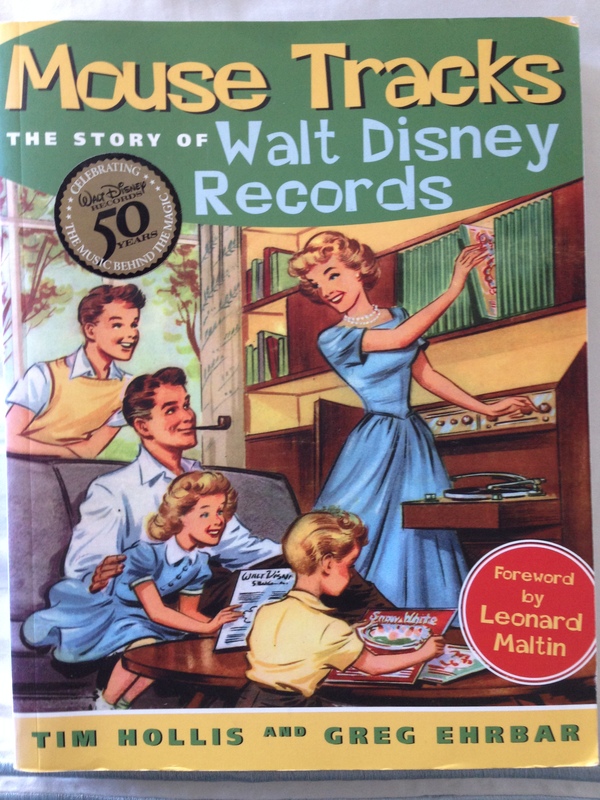 It should come as no surprise to the Disney enthusiast that Walt Disney was a pioneer in the recording industry. Disney was able to generate a great deal of revenue by licensing music from his popular films for others to record. In 1933, Disney released the short film The Three Little Pigs as part of his Silly Symphony series. Not only was the cartoon a success, but it also produced a hit song “Who’s Afraid of the Big Bad Wolf.” Disney licensed and recorded the song and it became an anthem of America’s courage in the face of the Great Depression. In the early days of cinema, it was easier to rerecord music from a film then to use selections from the actual soundtrack. Walt Disney was about to change all that. The authors write “From Edison’s time until World War II, it was more technically feasible to recreate songs from the films and shows in a separate studio either with or without original cast members. Instead of replicating the style of the original work, the arrangements were often reinterpreted for dancing and radio play.” This changed with Snow White and the Seven Dwarfs. They continue, “Victor’s [records] 1938 three disc set of songs from Disney’s Snow White and the Seven Dwarfs (1937) became the first soundtrack album from a feature film, followed by the soundtracks of Pinocchio (1940) and Dumbo (1941).” Walt Disney ostensibly invented the soundtrack recording industry. The book details how The Ballad of Davy Crockett became a megahit and how it was a game changer not only for Disney, but for just about every artist involved. Similarly, we’ll learn how the Record division helped brand the Mickey Mouse Club long before a single episode ever aired and how the Mickey Mouse Club subsequently became an ongoing resource to generate more recordings. The book also examines how the company had to change with technology. What began as a venture selling discs, had to adapt to cassettes, comapact discs and now digital media. Through it all one thing is clear: Disney’s success in the cinema and television extended to the recording industry, creating an additional stream of revenue, additional means to reinforce the Disney brand, and the opportunity to keep the joy of the movies, television shows and ultimately the theme parks with you at home. The book also highlights the talent that created these marvelous recordings. You’ll meet composers, producers, illustrators and the actors whose vocal talents shaped the sound of the Disney brand. 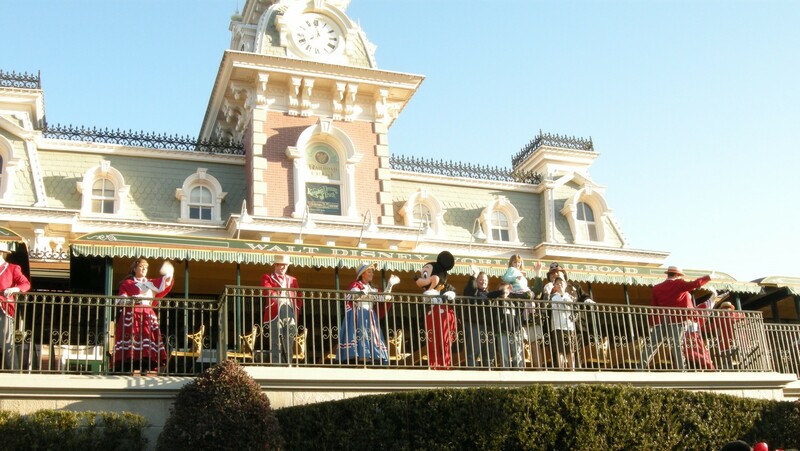 Many of these actors are still heard in the Disney Parks today. You may not know who Thurl Ravenscroft, Paul Frees, Dal McKennon and Janet Waldo are for example, but you know their voices. Now you’ll know their stories. The book used to be sold in the theme parks, but if it is no longer available there you can surely acquire a copy online. In the coming weeks, I will provide highlights of some of the vocal talent featured in the book. If you grew up enjoying records and cartoons, this book will be a nostalgic trip. If you are a Disney enthusiast, the book chronicles a heretofore neglected aspect of the Disney company and celebrates the numerous artists whose talents have shaped the Disney brand.